I know many are intimidated by the thought making Poached Eggs, but it really is quite simple. The key is to poach the egg until the white is set and the egg yolk is runny, which means temperature control and timing. If you prefer a firm yolk, a little more time at the controlled temperature is all that is required. Farm fresh eggs are the best for poaching. The egg whites are nice and tight so there’s less spread in the pan. For an older egg, a dash of white vinegar in the cooking water helps coagulate the egg white. There are also egg poaching machines and lots of little cups, etc that claim to make pretty poached eggs. I don’t see the point myself and they would only take up more space in my already full kitchen. To make them the old-fashioned way, fill a low rimmed saucepan or a straight-sided skillet with cold water, high enough to cover the tops of the eggs. Add almost a capful of white vinegar and bring to a full boil. Place a couple of folded paper towels by the side of the stove to briefly drain the cooked eggs on before plating. Crack up to 4 eggs in a small bowl, slide the eggs into the hot water and immediately lower the heat to the gentlest of simmers. Cook for 2 minutes 30 seconds for a runny yolk or 3 minutes for a firm yolk. The key to success here is the gentle simmer, a rapid boil is harsh, and the eggs are easily ruined by the turbulent water. Use a mesh skimmer spoon and gently scoop up all the eggs together. Rest the bottom of the skimmer spoon on the paper towels to drain for a couple of seconds and then slide onto your plate. Sprinkle a wee bit of kosher salt and ground pepper over the eggs and dig in. Hollandaise sauce recipe coming next week. Watch our video here. Note: Since making the video, I prefer to crack my eggs in a bowl and slide them into the water vs. cracking them individually into the pan. They keep better shape and cooking time is even for all. Farm fresh eggs are the best for poaching. The egg whites are nice and tight so there’s less spread in the pan. For an older egg, a dash of white vinegar in the cooking water helps coagulate the egg white. The key is to poach the egg until the white is set and the egg yolk is runny, which means temperature control and timing. If you prefer a firm yolk, a little more time at the controlled temperature is all that is required. Fill a low rimmed saucepan or a straight-sided skillet with cold water, high enough to cover the tops of the eggs. Add almost a capful of white vinegar and bring to a full boil. Sprinkle a wee bit of kosher salt and ground pepper over the eggs and dig in. I love the smoky flavors and my go to spices for adding that earthy smokiness are ancho and chipotle chilies and smoked paprika. These are the predominant flavors in my Mexican Deviled Eggs, combined these with lime juice, Mexican oregano and a hint of cumin. The result is a spicy, smoky deviled egg. Remember, deviled eggs aren’t just party food. Eat them for breakfast or lunch. Do you love egg salad? Instead of stuffing the egg whites, chop them up and blend in with the puréed yolks, add a little more crema or sour cream if it’s too thick, spread on a tortilla, top with some lettuce and tomato and you have a Mexican egg-salad sandwich! 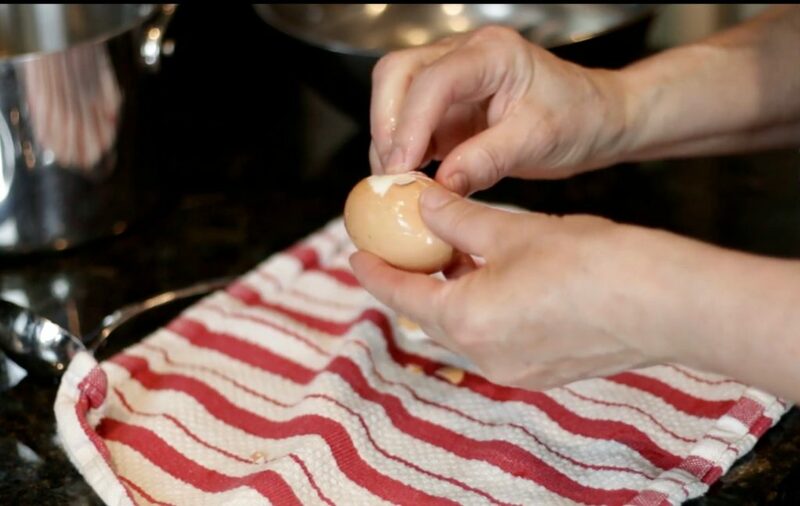 See our post/video on making hard-boiled eggs here; or use store-bought hard-cooked eggs to save time. NOTE: Queso fresco is a mild, semi-soft Mexican cheese and is available at most major grocery chains. Stir in shallots, garlic and salt; sweat for 4 minutes or until the shallots are soft. Add the ancho chili powder, smoked paprika, oregano and chipotle powder and cook, stirring constantly, until fragrant, 30-40 seconds. Place the egg yolks, crema/sour cream, queso fresco, lime juice, in the base of a food processor. Purée, scraping sides as needed. Add the cooked shallots and purée again. Fill the cavity of each egg white with the egg yolk purée by using a spoon or a piping bag. Garnish each egg with a pinch of shredded queso fresco and/or a cilantro leaf. Cover and store in the refrigerator for up to 4 days. Best served at room temperature. Queso fresco is a mild, semi-soft Mexican cheese and is available at most major grocery chains. Easter means an abundance of hard-boiled eggs. What do you do with them when the holiday is over? How about deviled eggs. 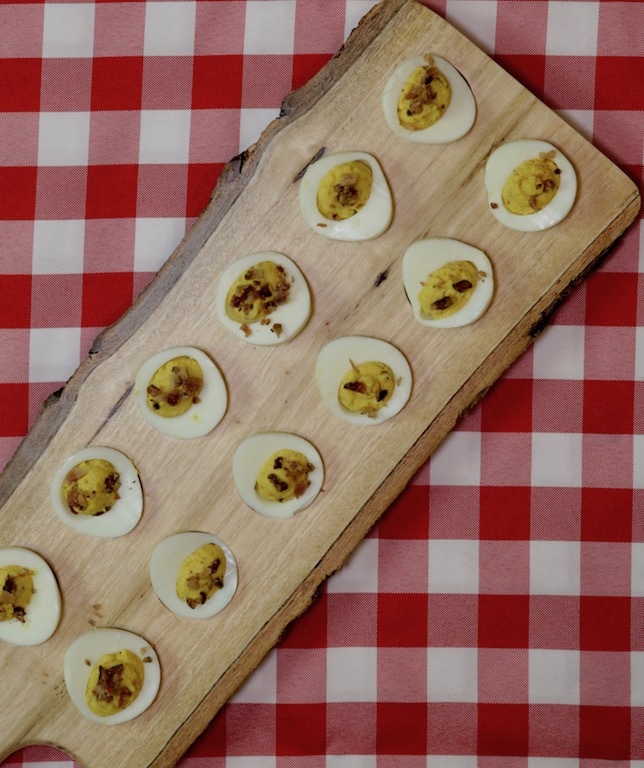 Here’s a delicious recipe for Cheddar Cheese and Bacon Deviled Eggs, sure to please everyone. Deviled eggs aren’t just for parties, they make a great breakfast, especially these, similar to an omelette or a typical bacon and egg dish. Prepare the eggs in advance and pack a few for your coffee break at the office or in the kids’ lunches. Another use for deviled eggs is to chop up the egg whites and fold into the deviled egg mix for a delicious egg salad. Add another tablespoon or two of mayonnaise or yogurt to loosen up. Don’t have a lot of time? Purchase pre-cooked and shelled hard-boiled eggs and this recipe comes together in minutes. Watch the Cheddar Bacon Deviled Egg video here. Stir in shallots and salt; sweat for 4 minutes or until the shallots are soft. Place the yolks, 2 bacon strips, Cheddar cheese, mayonnaise and hot sauce in the base of a food processor. Purée, scraping sides as needed. Add the cooked shallots and purée again. Garnish each egg with the bacon bits. The bacon is used in two different steps; two strips are used in the recipe and one for a garnish. I love a sunny-side up egg. The problem is that not many people cook them right. I want a sunshine yellow runny egg yolk, but I don’t want uncooked egg white on the top. Here’s my secret to cooking sunny-side up eggs! My secret is to use an ice cube! It keeps the yolk high and prominent, perfectly runny and the egg whites cooked through. Put a generous dollop of butter in a skillet over medium heat to melt. Once the butter foams, crack your egg(s) into the hot skillet and lower the heat a tad. Pop an ice cube into the skillet. Cover with a convex cover – like the one below. The cover is going to jiggle and the butter sputter a little from the steam of the melting ice cube. Remove the cover and you have a beautiful sunny-side-up egg! Watch the How to Cook a Sunny-Side Up Egg video here. 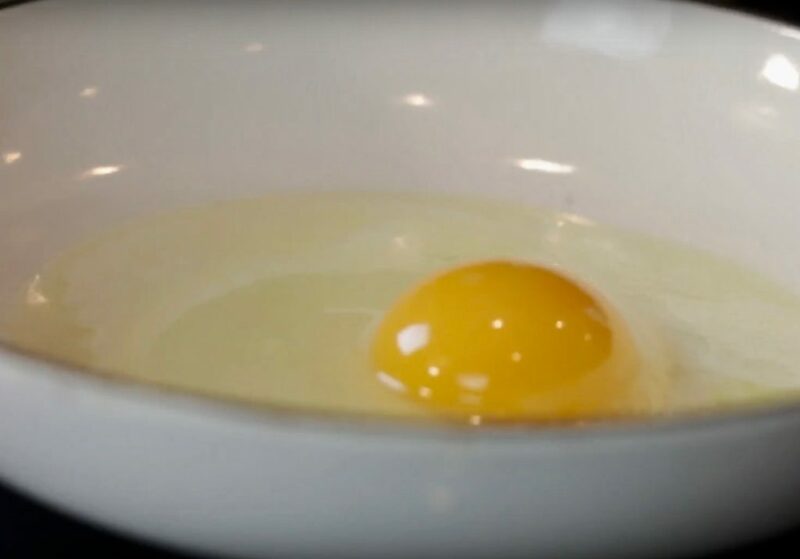 Use our fool-proof method to cook the perfect sunny-side up egg – an ice cube! Once the butter foams, drop 2 eggs into the skillet and add 1 ice cube. 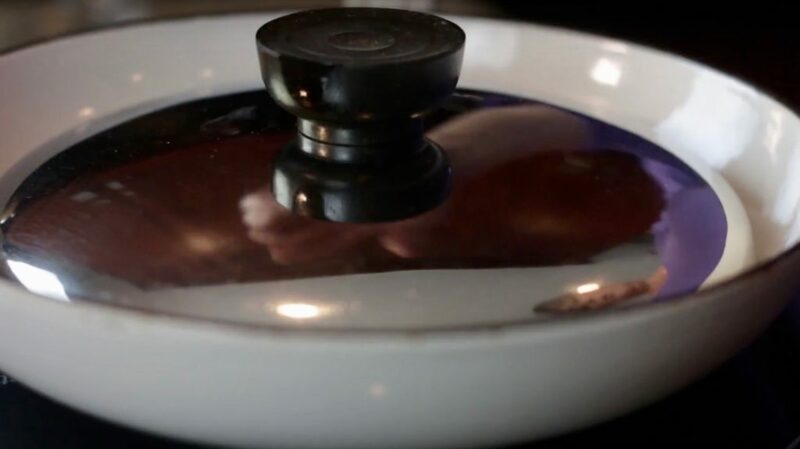 Use a convex lid to cover the pan and cook for 60 – 90 seconds. Slide the eggs onto a warm plate. I googled for recipes of scrambled eggs with dairy and without. It was interesting to see how each method has die-hard fans. Does it make a difference if you use dairy nor not? The water content of the egg white evaporates during cooking. Adding milk, especially whole or 2-percent milk, has added fat and water to keep the eggs moist. Lack of dairy produces a scrambled egg that is a little drier and less fluffy, but with more of an eggy taste. The difference is negligible, though. You decide what’s right for you. See our post for an in-depth explanation on how to cook protein, which explains why we recommend cooking low and slow. Beat the eggs well and season with salt and pepper before cooking for optimum flavor. A non-stick skillet requires less fat than a regular skilled. I prefer butter for the sweet taste it imparts, but you can easily substitute coconut oil or vegetable oil. 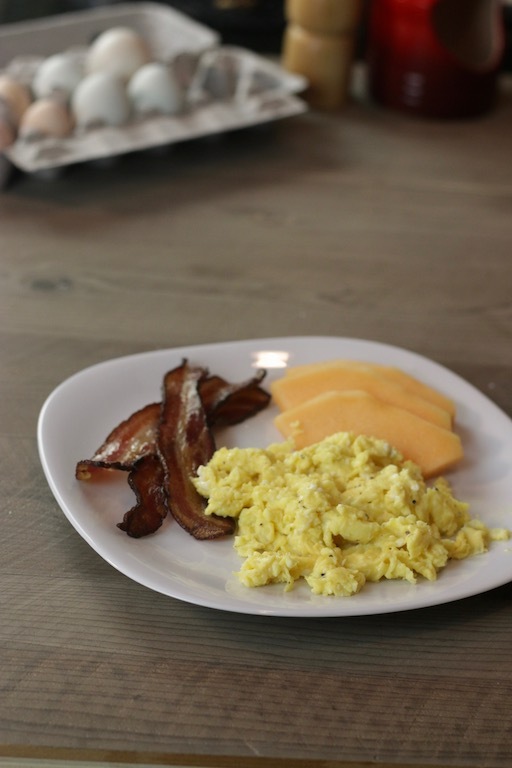 Watch the Scrambled Eggs without Dairy video here. 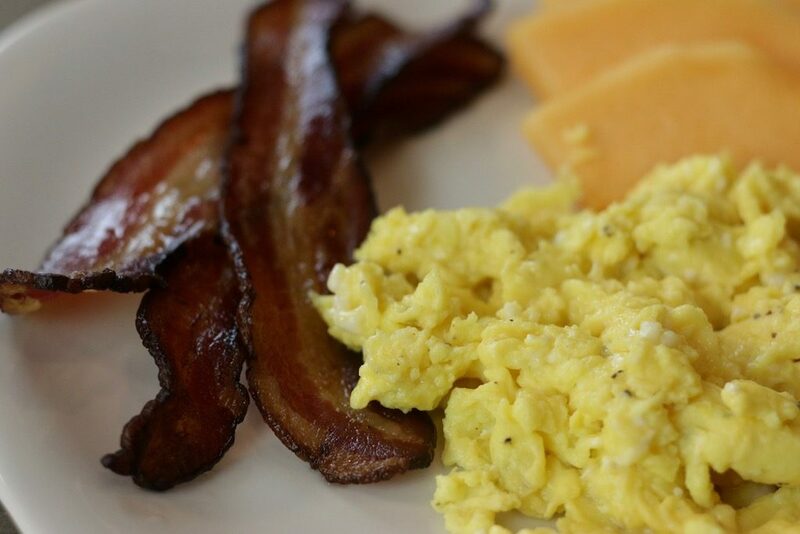 Adding a little milk or cream to your scrambled eggs makes lighter fluffier eggs. 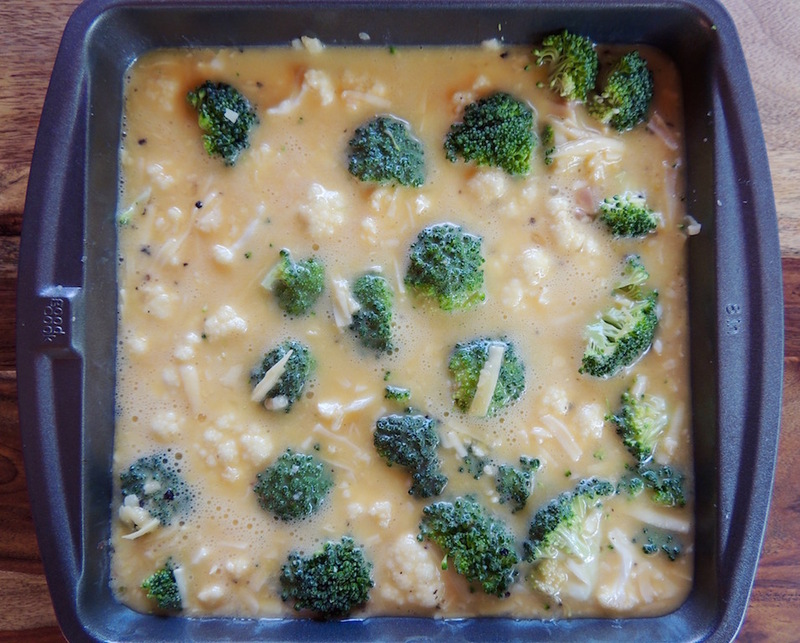 A tablespoon or two for 2 or 3 eggs is sufficient, substitute soy, almond or coconut milk, if desired. Final flavor varies. Watch the Scrambled Eggs with Dairy video here. Scrambled eggs are delicious for any meal. For lunch place in a pita or wrap with some bacon and sliced tomatoes. Beat the eggs, dairy, salt, and pepper in a medium bowl until frothy. Heat the butter over medium heat in a skillet. Once the butter is frothy, pour in the scrambled eggs and gently and continuously stir to create curds. The eggs are done when all liquid disappears and the eggs are yellow and fluffy. Substitute soy, almond or coconut milks for cow’s milk. Curried deviled eggs are a classic preparation and curry and eggs are a natural pairing. These curried deviled eggs are perfect for a snack, packed in a lunch or as a party appetizer. An alternative use for deviled eggs is a twist on egg salad. Chop up the egg whites and stir into the egg yolk purée, add a little more mayo if it’s too thick, spread on naan or other bread and enjoy an egg salad sandwich! See our post on how to cook the perfect hard-boil egg here. Don’t want to be bothered making hard-boiled eggs? Here are a couple of brands of peeled hard-boiled eggs sold in grocery stores! 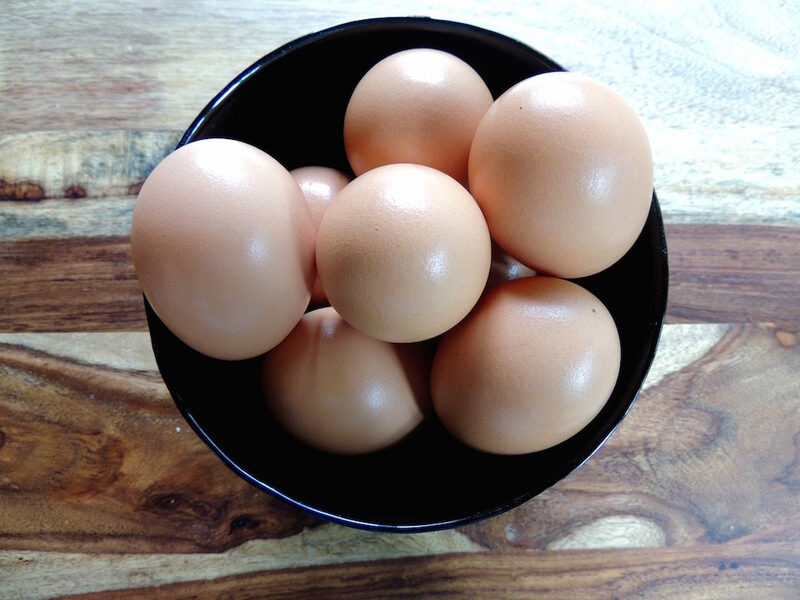 Look for Eggland’s Best Hard-Boiled Peeled Eggs or Crystal Farms Hard-Boiled Eggs Peeled. Watch our Curried Deviled Egg Video Here. Curried deviled eggs are a classic preparation and curry and eggs are a natural pairing. These curried deviled eggs are perfect for a snack, packed in a lunch or as a party appetizer. An alternative use for deviled eggs is a twist on egg salad. Chop up the egg whites and stir into the egg yolk purée, add a little more mayo if it’s too thick, spread on naan or other bread and enjoy an egg salad sandwich! Add the curry powder and cook, stirring constantly, until fragrant, 30-40 seconds. Place the yolks, mayonnaise and lime juice in the base of a food processor. Purée, scraping sides as needed. Add the cooked shallots and purée again. Garnish each egg with a pinch of lime zest. Zest the lime before juicing! 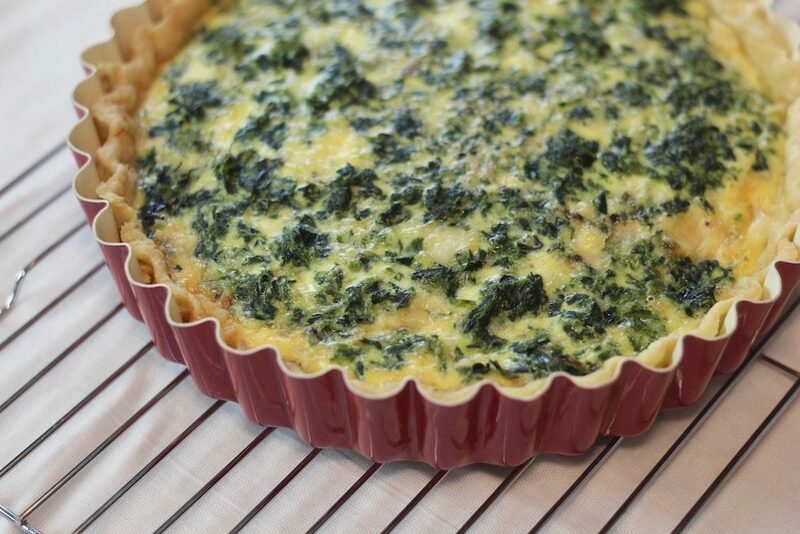 Quiche is simply an omelet in a pre-baked pie shell. It makes for a different presentation than what we usually eat for breakfast and you don’t have to make toast, the crust is a delicious alternative. See our post video on how to blind bake a pie crust. NOTE: Since taping this video, I now prefer to completely blind bake the crust and not partially as suggested in the video. Quiche is also a wonderful way to use leftovers. Dice up the remains from a charcuterie platter, sharp cheese, salty spicy salami, dice some onions and garlic add in some fresh herbs and you have an improvised quiche. 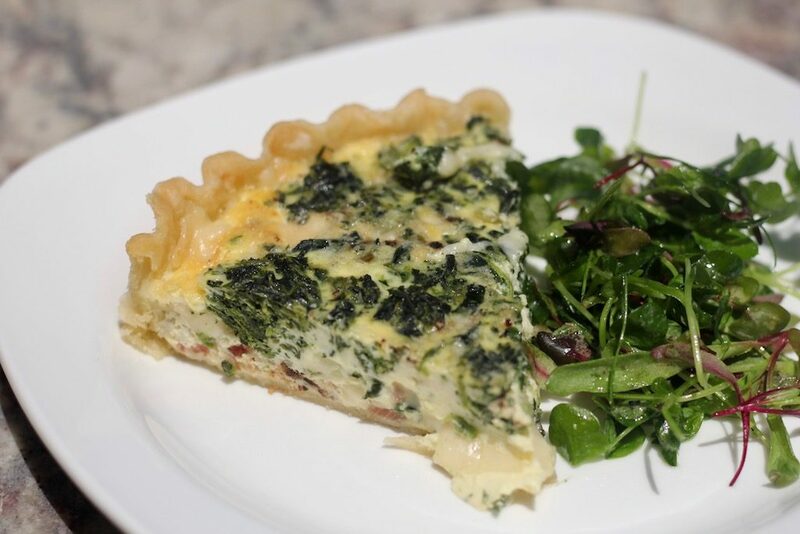 Leftover steamed or roasted vegetables are also great starters for quiche. Use your imagination when you go to the store; look at the fresh produce and select what strikes your fancy and don’t forget some fresh herbs. Pick a cheese, almost any cheese works, that pairs well with your produce or suits your mood that day. The possibilities are endless. Quiche is delicious served hot out of the oven, but it’s also great at room temperature and it travels well. Pack it for lunch for the kids or for yourself at work. 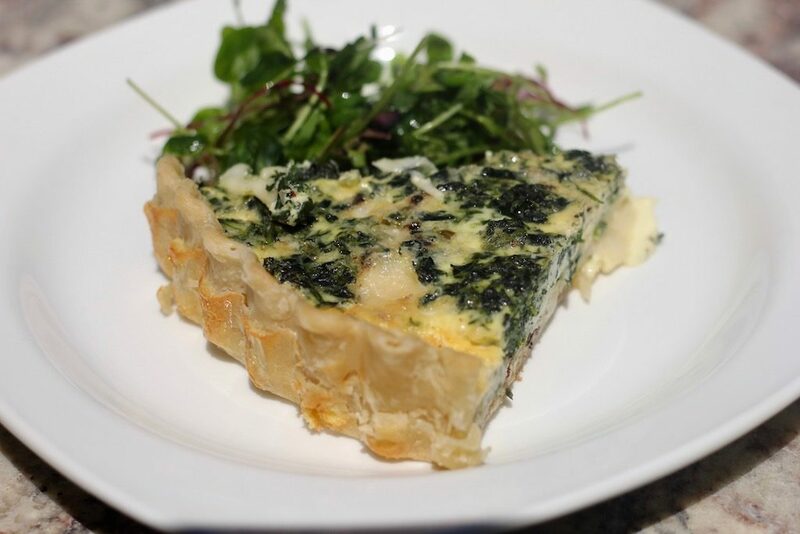 A quiche is simply an omelet in a pastry shell. The possibilities for fillings are endless. Use leftovers or your imagination to create an unending variety! Place the eggs in a medium mixing bowl and whisk until foamy. Whisk in the half and half, salt and pepper. Strew the cheese, spinach, bacon and shallots over the bottom of a half blind-baked pie shell. Pour the egg mixture over all. And put on a foil line baking tray. Bake for 30 minutes or until the custard is set. Let sit for 10 minutes for slicing. Line a baking tray with foil or parchment and place the quiche on this for baking. If the quiche leaks, the baking tray contains the mess and keeps your oven clean. The quiche needs to rest before slicing to allow the eggs to finish gelling. The key to a successful hard boiled egg is gentle heat and slow cooking. By using this method, the egg is moist and tender with no off odor and a perfectly yellow egg yolk. 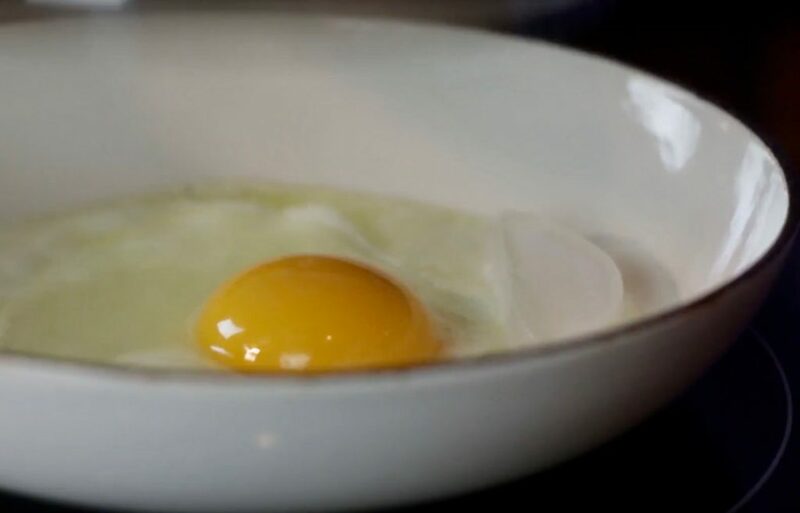 Overexposure to high heat releases sulfur from the egg white and iron from the yolk, which results in that unpleasant odor and gray-green coloration on the outer yolk. Place eggs in a pan large enough to hold the eggs so they are covered by two inches of cold water. Bring to a boil, turn off the heat, cover and let sit for 12 minutes. Plunge the eggs into an ice bath and let cool completely. Crack and peel for delicate and delicious hard boiled eggs! 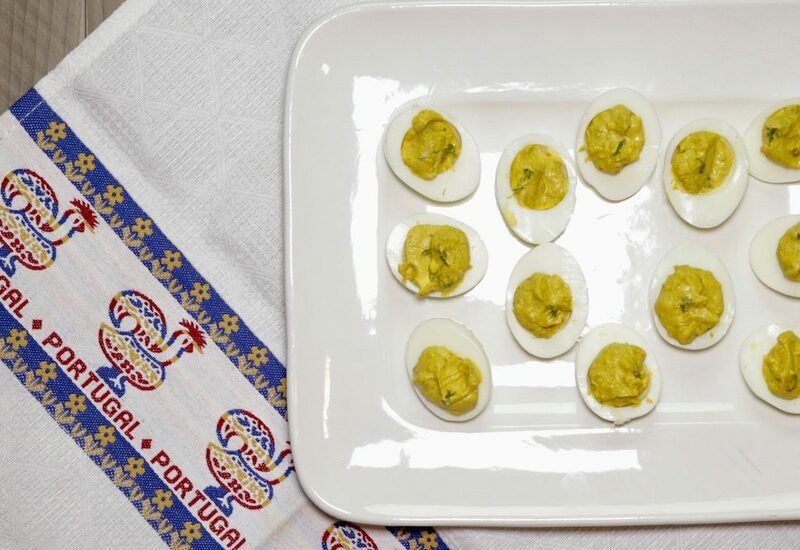 Here’s a recipe for Curried Devil Eggs. Mornings are hectic and it’s unlikely that a home-cooked robust breakfast is appearing on the table. Everyone is in hurry to grab a bite and catch the bus or head off to work. This is a very good time to have breakfast for dinner with a Baked Cheddar Cheese and Ham Omelet. Eggs are nutritious and versatile. You can prepare them simply by frying, scrambling or poaching. 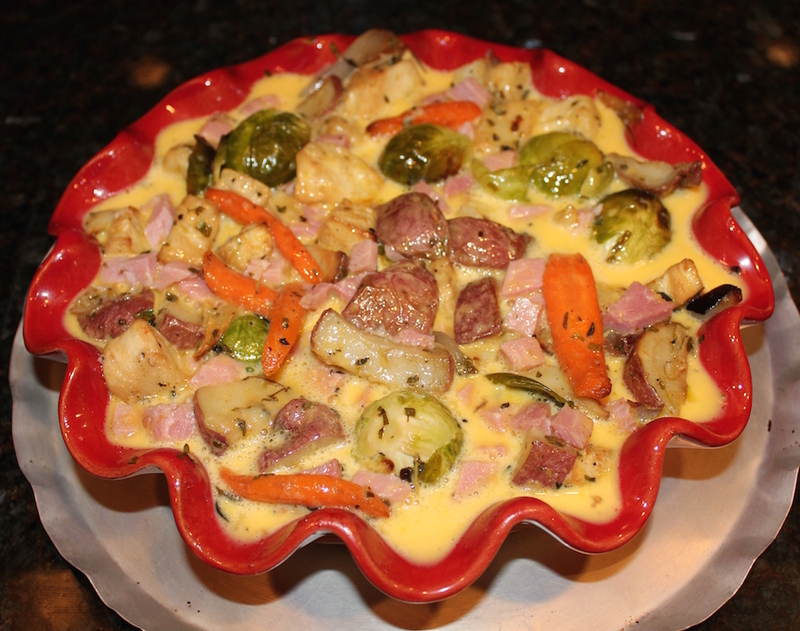 Serve with toast and ham or sausage on the side and some steamed vegetables. Simple, quick and easy. You can also make heartier preparations like baked omelets. I recommend cooking extra vegetables on the weekend, cut them up and put in a container. Buy a slice of ham and dice it up and save in a container or pre-cook some sausages, dice up and save in a container. Sauté a diced onion and save in a container. Having roasted root vegetables this weekend? Save the leftovers in a container. Don’t have leftovers? No worries. 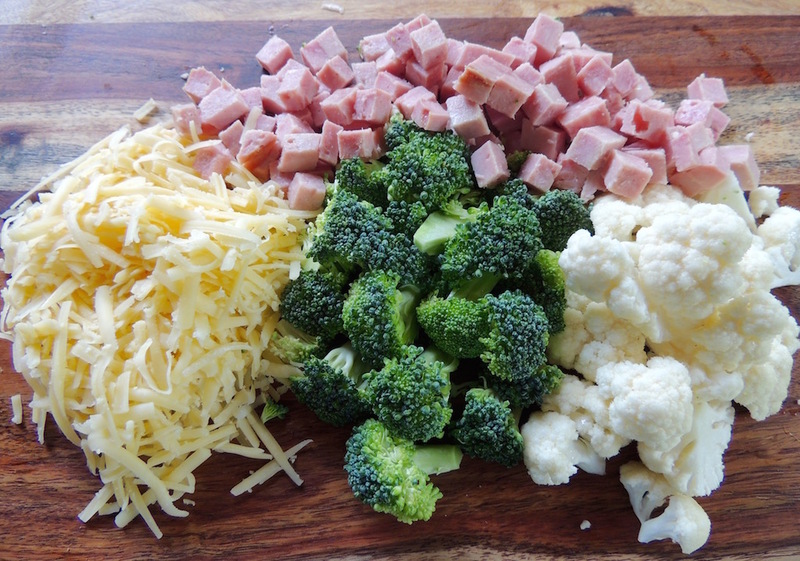 Take advantage of the pre-cut vegetables most grocery stores offer these days: thinly sliced bell peppers, little buds of broccoli or cauliflower. Buy a zucchini or some green beans and cut into bite-size pieces. Best of all, there is no need to precook these vegetables. Pick up a package of your favorite shredded cheese and you can prep dinner in 20 minutes or less. What to serve on the side: toasted English muffins, a nice crusty bread, muffins or scones; you don’t have to bake, pick them up with your morning coffee! Warm the bread, muffins or scones in the oven after you remove the omelet, which needs to sit a good 10 minutes to set before slicing. A nice green salad or a side of steamed vegetables rounds out this meal nicely. While the omelet bakes you can set the table, or perhaps the kids can do that when they get home from school, check on homework status, get into some comfortable after-work clothes and maybe even have a glass of wine! You’ve made a delicious, nutritious meal in a very short time with very little cleanup after and it’s economical. If you have any leftovers, send it the lunchbox. Preheat the oven to 375 degrees F and lightly grease an 8- by 8- by 2-inch cake/brownie pan. Beat the eggs, half and half, salt and pepper until frothy. Scatter the fillings across the bottom of the pan and cover with the scrambled eggs. Bake in the preheated oven for 45 minutes. The omelet is done when puffed, solid in the middle and a little golden on the edges. Let sit 15 minutes before slicing. Send leftovers in the lunch box tomorrow. What do you do with leftovers? Repurpose them into a Roasted Vegetable and Ham Frittata. 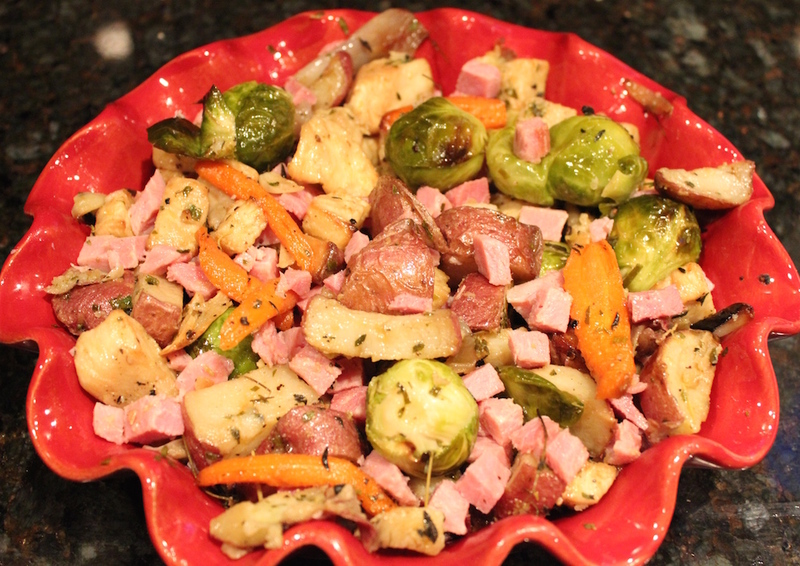 We had leftover roasted vegetables from dinner and leftover ham from the split pea soup I recently made. I tossed the vegetables and ham together and put them in the bottom of a buttered deep-dish pie pan. It took nine well-beaten eggs with to cover this. I didn’t add any salt and pepper to the eggs because the vegetables were well seasoned and the ham salty. It was the right decision, adding any more salt would have been too much. We had the frittata for dinner with enough leftover for lunch the next day. Place the vegetables and ham in the bottom of a lightly greased deep-dish pie pan. Beat the eggs and dairy until frothy. Pour over the vegetables. 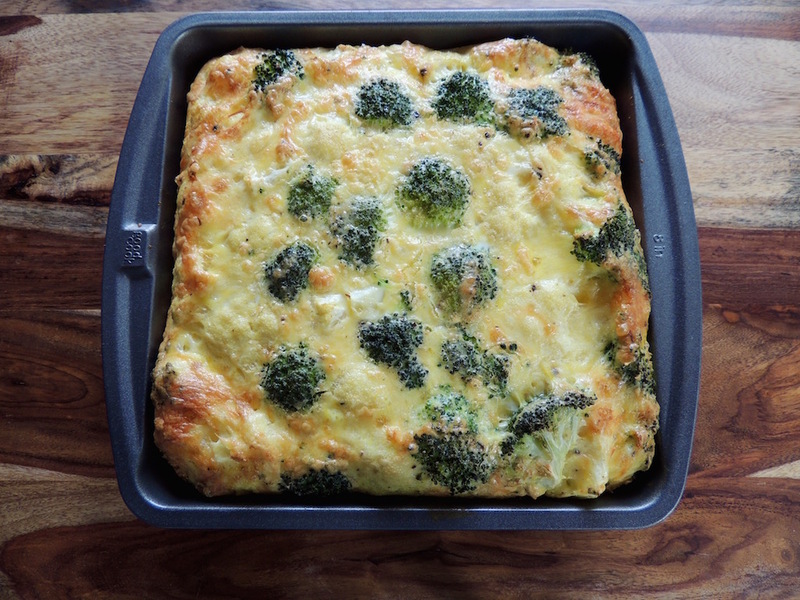 Bake for one and one-quarter hours or until the frittata is completely set. Test with the blade of a knife. The frittata is done when the knife comes out clean. The vegetables I used were well seasoned and I opted not to season the frittata. Be sure to taste your leftovers before seasoning. Beat the eggs and milk until frothy. Bake for one and one-quarter hours or until the frittata is completely set. Test with the blade of a knife. The frittata is done when the knife comes out clean. Let sit for 10 minutes to solidify. 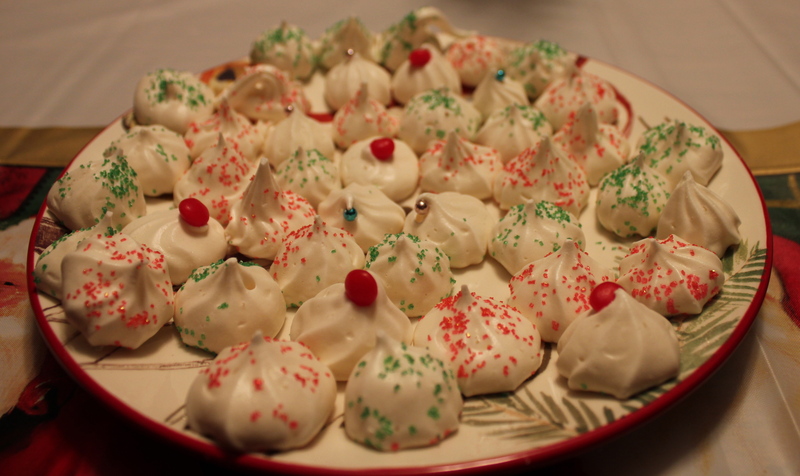 I’m not a huge fan of meringues, but I think they’re beautiful to look at. These French Meringue Kisses are particularly pretty. They kind of remind me of cotton candy – airy, sweet and not much else. But other love them and I love pleasing others with their favorite foods. Crack a couple of eggs and gently transfer the egg yolk of each between eggshell halves letting the gloppy whites fall into a bowl below. Save the yolks for another purpose – cream anglaise or a French custard base. Let them sit for 30 minutes to come to room temperature. Beat either by hand with a whisk if you have stamina, a good arm and wrist action; or use a hand beater, portable beater, or electric mixer with a whisk attachment. The translucent whites begin to foam. That’s good. They begin to rise, that’s good, too. Keep on beating – harder and faster – if you’re doing this by hand, wipe your brow and keep beating. Once the egg whites are foamy and high, it’s time to add flavor, such as vanilla extract, and stabilize the foam with sugar. Tip the measuring cup filled with sugar and let a thin stream flow continuously as you beat. For those of you beating by hand, a helper is needed for 30 seconds or add in small batches between beatings. Watch the transformation as the foam stiffens and rises to a silky white mountain. The meringue is done once the foam stands high and straight, called the stiff peak stage, when you pull your whisk or beater straight up. The meringue is ready to be piped or spooned onto a parchment-lined tray at this point or fold in additional ingredients, such as chopped chocolate or nuts. Pipe or spoon onto the baking and bake at low-heat (200ºF) for one and one-half hours. 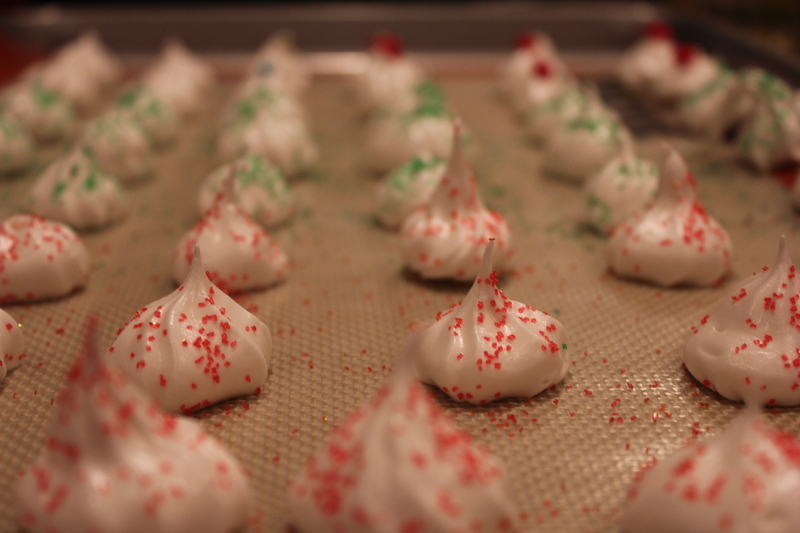 The meringue sets during this time but needs extra hours in the oven with no heat to dry throughout. 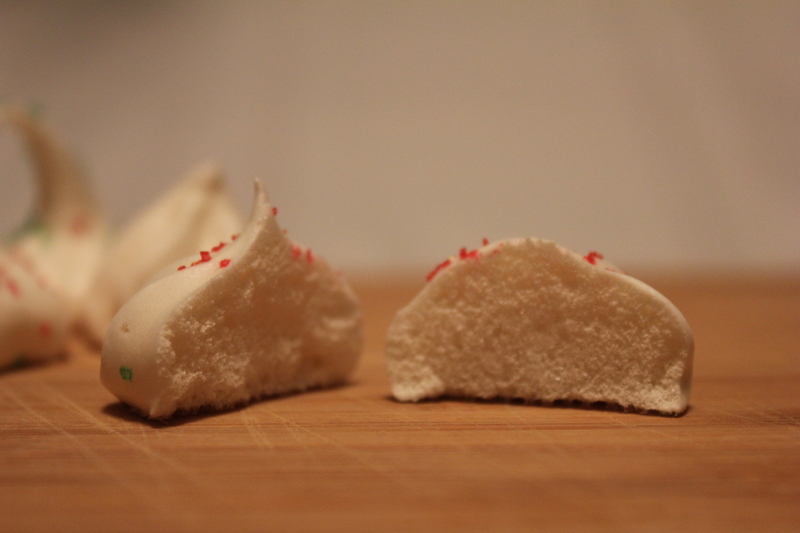 A properly cooked meringue is feathery light. Slice one open and the interior is porous. Pop one in your mouth and it dissolves instantly. 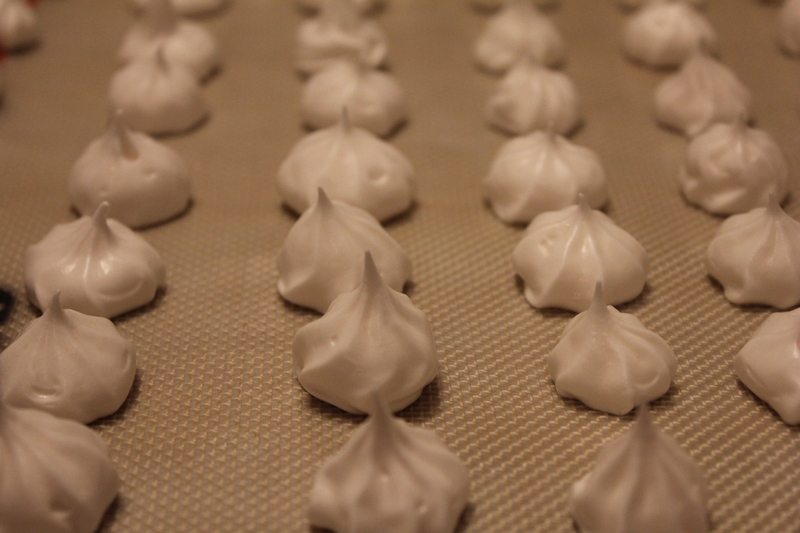 Store in an airtight container; meringues quickly absorb any moisture in the air, which softens them.